In particular, the best-execution requirements of MiFID II have motivated institutions to explore TCA solutions offered by a variety of market participants—fintech firms, trading venues, banks, dealers, and others. While the calculation of equity transaction costs has reached a mature stage given the swaths of data available to feed that process, TCA tied to other asset classes, such as fixed income, foreign exchange, commodities, and derivatives, is still developing and is far from straightforward. 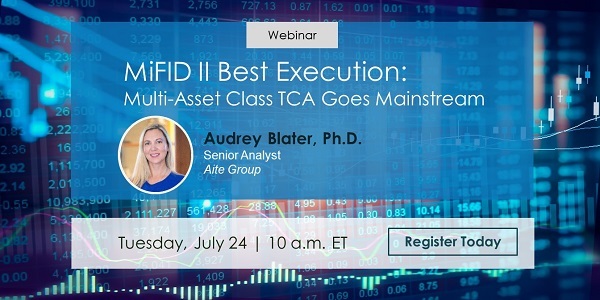 Join senior analyst Audrey Blater as she highlights findings from her latest report, MiFID II Best Execution: Multi-Asset Class TCA Goes Mainstream. How will the evolution of FICC (Fixed Income, currency, and commodity) TCA change in the future? Who is providing TCA services? How are investors putting TCA output to work? What can we expect from TCA providers going forward?